MET too Youth Company. Photo by Ben Doyle. At this point, the struggle of a young dancer trying to make it into the professional world is cultural fodder. Think Flashdance, the Center Stage films and several musicals. Outside of New York and Hollywood, second companies – across the country – are a space where young pre-professional dancers grow into their professional “own”. MET too Youth Company, a second company of METdance (Houston, TX), offers a rigorous, non-competitive training and performance program. It’s specifically designed to prepare company members for dancing in higher education and/or professionally. The high expectations of, yet openly available support for, the dancers seems to further strengthen this bridge from pre-professional to professional dancing. 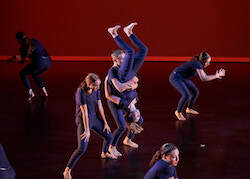 Here, Dance Informa speaks with Genene McGrath, MET too Youth Company manager and METdance company member, to learn more about the second company. 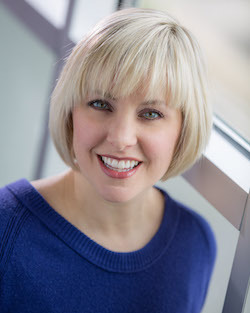 She came on to assist Marlana Doyle, METdance artistic director, with administrative work and supporting the company members. 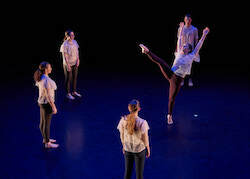 The MET too Youth Company, including 14 dancers and two trainees, is very intentionally a non-competitive company, with a strong focus on training. 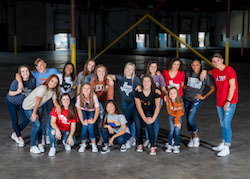 “There are so many options for competitive dance in Houston, and the difference in our company is that because we don’t compete, the dancers can fully focus on their artistry,” explains McGrath. The company is in the studio Tuesday through Thursday evenings and all day on Saturdays. They train in ballet, pointe, jazz, modern and contemporary styles. McGrath says that the students are generally very good at balancing their schoolwork with this intensive schedule. In a professional dance sector calling on hired dancers to be more and more versatile all the time, and a higher education dance environment reflecting that condition, this versatility is key. McGrath shares how she was a primarily classical dancer, and METdance pushed her to strengthen her contemporary artistry. It’s the same for many of the “too” dancers. Doyle, McGrath and all METdance faculty reinforce the importance of versatility. 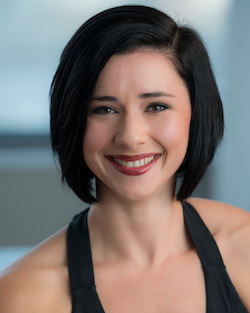 McGrath explains, for instance, that if a student strongly prefers contemporary over ballet, “we tell them the truth that at many contemporary auditions, they’ll first have to do a ballet class and demonstrate strong technique!” She adds that “it’s a balance between pushing them out of their comfort zones and nurturing them there,” so that they can further enhance their strengths. Within this frame of broad and diverse training, they rehearse for several performances a year. The MET too Youth Company members don’t have consistent obligations with the company in July, and additionally train at other intensives during this summer period. They’re back with the company in August, with the beginning of school. They immediately learn and polish a new work to perform in the “Season Kick-Off” with the main METdance company. They delve into learning choreography at this time of year as well; McGrath explains how they learn most of their choreography in September and November. The choreography is challenging and true to the essence of its designated form, shares McGrath. “We’re asking some things of them that we ask of professionals,” she asserts. 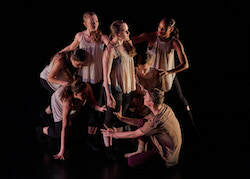 Within this professional atmosphere are connections with METdance company members, above and beyond McGrath, such as with a main company member setting a new work on the “toos” every year. Terrill Mitchell, former seven-year METdance company member, also teaches and choreographs for the second company. “He knows what we expect of them, and is also clear on what he’s looking for from them,” says McGrath. In December, they perform again, with pieces they’ve learned thus far – for parents, other family members and friends, and anyone in the local community who’s interested. They’re then given a choreographic duet challenge in “DUO too”, the fruits of which they perform in February. This year, Doyle and McGrath paired them off as duet partners (at other times, the dancers pick out of a hat or get to choose their choreographic collaborators), and also assigned music and dance style for each duet. “Sometimes, the dancers are apprehensive about choreographing and overwhelmed, but we support them through it,” McGrath says. “[Marlana and I] are here to help if they’re struggling, and we let them know they’ll be fine!” Proving them right, McGrath describes how it’s great to see how the work of multi-year “toos” evolves. This opportunity to start developing choreographic skills can serve them well in higher education or as professional dance artists. It can perhaps also spur an interest in a choreographic career. The “toos” have their end-of-year concert (of just the MET too Youth Company), in May at the MATCH Theatre. In this performance, they get a chance to have two nights to show all the works they have been working on all season. In June, they perform in the “Sizzling Summer Dance” concert with METdance at the Miller Outdoor Theatre, which sees about 3,000 audience members. Evidently enough, much is asked of these young dancers – in an already challenging time of life (physically, hormonally, socio-emotionally, academically and more). Much assistance and support is also provided, both practical and emotional. On the practical side, METdance offers the “toos” professional development events, such as resume writing workshops, and “mock” (practice) auditions. They also assist in talking about a college plan, giving recommendations and assistance applying to college. On the informal side, all professionals working with the “toos” set examples of, and expectations for, professionalism in all communications (down to email tone and grammar) and studio demeanor. With emotional support, Doyle and McGrath’s doors are always open if the dancers need to talk something out. “I’ll have them come to me and say, ‘Hey, I need to talk about something non-dance.’ I totally welcome that, and I think that it’s great that they’re comfortable talking to us like that,” says McGrath. When it comes to social dynamics, McGrath thinks that being a non-competitive company helps, but minor issues do arise. By and large, the dancers are comfortable letting McGrath and Doyle know of any brewing issues. They can in turn alert other “too” teachers, McGrath explains. This open communication helps most issues settle before they blow up into anything harmful. Social, emotional, technical, artistic, professional – METdance nurtures all these parts of its dancers. It’s a true holistic mindset, of acknowledging all parts of the person who is the artist, in action. It’s a foundation on top of which these young dancers can bridge the often turbulent waters between pre-professional and professional dancing. For more information on MET too Youth Company, visit www.metdance.org/mettoo.